When I was growing up I spent a few years living in Trinidad. I have been in Scotland for about 20 years now, but even after all that time I have kept in touch with a few of the people I was friends with when we lived there. 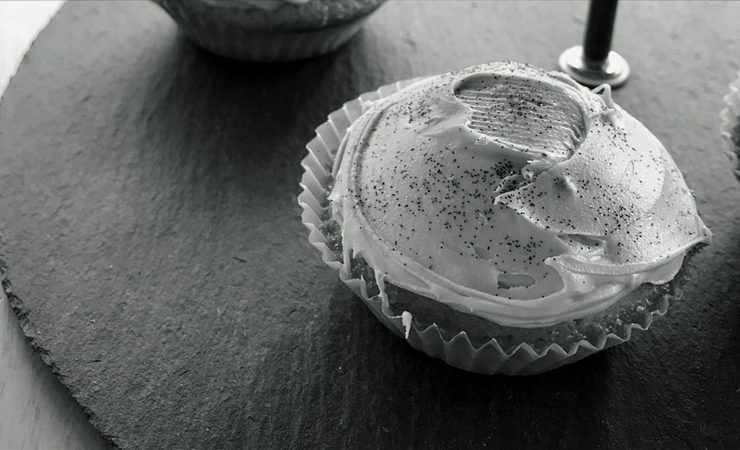 Today I have a guest post from Stacey, who one of my best friends all those years ago. She now lives in Canada with her husband (who she married over here in Scotland – excellent choice guys!) and their beautiful baby girl. 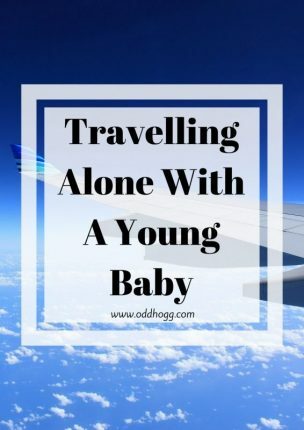 Stacey recently took a trip to Trinidad to visit her Dad and asked if she could share her experience of flying alone with her daughter here on OddHogg. I love hearing others persepective so of course I said yes. This is what she had to say. Hello! 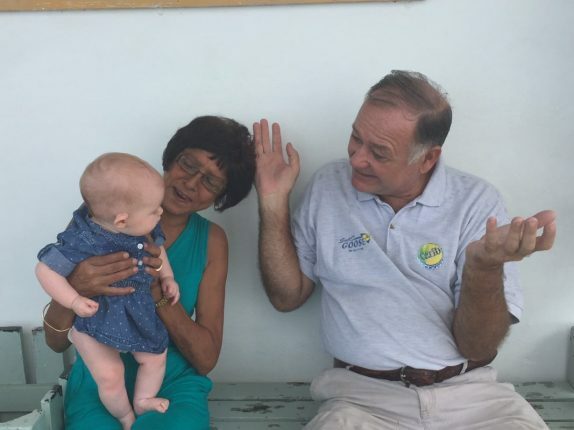 I’m a first-time mother to a beautiful 5-month-old girl (Cecilia), and this January I decided to take her on a trip to visit my father in the Caribbean, since I am on maternity leave. When I started planning the trip, my husband and I had a big discussion around when to go, how long to go for, etc. He and I decided that it would be better for him to stay home, since he is paid hourly; vacation for him means no income. And since my income is already reduced significantly while on mat leave, that would have been difficult to manage with the brief time we had to plan the trip. It also meant that my daughter and I could go on a longer trip without him. So, I booked my plane ticket and started planning my solo trip with my daughter. True to my nature I did a ton of research – travelling with a baby under 6 months, breastfeeding on an airplane, how to keep small babies occupied in airports, how to change a baby on an airplane, what to take in a carry-on with a baby… I learned a lot of valuable information. And there were some things I just plain didn’t think of; some of it went ok despite not being prepared, and some not so much. I wanted to share what I learned, and my friend Kim has kindly allowed me to do a guest post for her blog. 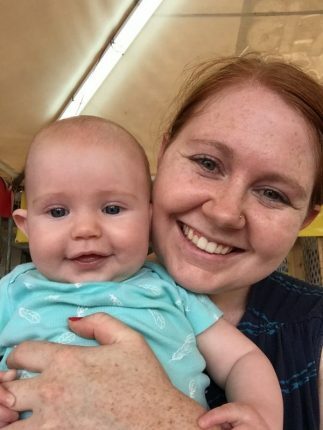 While the lists of things to take and the tips of how to travel with an infant are useful (and there are quite a few good ones out there already), I want to talk about my homesickness and Cecilia’s adjustment when we first arrived, and our not-so-great homecoming. After a long 14-hour day of travel by myself with Cecilia it was wonderful to see my Dad and his partner waiting to pick us up at the airport arrivals gate. The trip itself had gone pretty good for a first trip with a baby – Cecilia barely cried on either flight, I managed to change her dirty diapers in the tiny lavatory without too many mishaps, and she slept while I watched movies on my iPad for most of both flights. To top all of that off, we received a lot of compliments as people filed past us to get off the plane; everyone was impressed with how quiet Cecilia had been, how cute she is, and my bravery and general “awesomeness” for travelling alone with a young baby. I left the airport feeling great about myself and my daughter, feeling relieved that we had arrived safe and sound, and feeling loved and welcomed by my Dad and his partner. Of course, we arrived pretty late (around midnight) so we got to the house and everyone pretty much went to bed right away. Well, everyone except Cecilia, who was not happy about the climate change (hello going from -30C and 20% humidity to +30C and 75% humidity), the elevation change (1045 meters/3428 feet above sea level to, you know, sea level), the different dogs and people around her, and I’m sure many other things. She started to cry – no, scream. And my Dad’s partner tried so hard to help by walking Cecilia and bouncing her and cuddling her, but ultimately I was the only familiar thing Cecilia had, so I was the only one who could really do anything to help. I hadn’t thought of, not at her age. 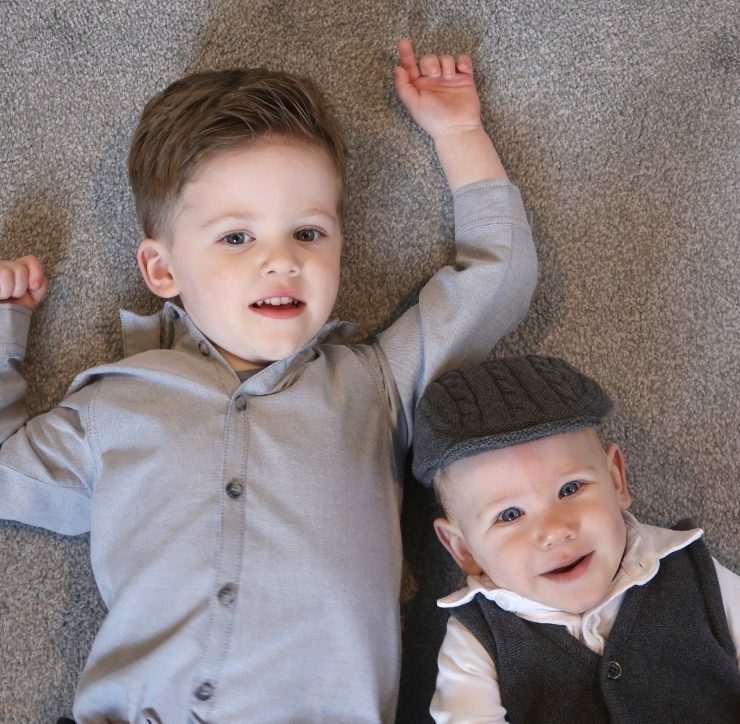 I knew travelling with a toddler or older child can be hard because they’re so used to their routine, their stuff, their home, that it can be a tough adjustment when you’re somewhere new. But a 4-month old baby? I figured she was too young to really have much routine and familiarity. Wow, was I wrong. And I missed my husband so much; I realized how much I rely on him helping and even just being there to comfort me while I comfort our daughter when she’s fussy. Not having him made everything that much harder to handle. The rest of our trip was fantastic – we had a great time visiting places I’d been to as a child, trying new things, and just spending time together. When it came time to get on the airplane to go home, I was quite down about it, for many personal reasons. I was also anxious about travelling, again. Even though I had done it before and it had gone just fine. And once again, Cecilia was great on the airplane – same routine as the first time, same compliments (including the guy behind me who didn’t even know there was a baby in front of him until he stood up to get off the plane and saw us). The trip home was filled with sadness about leaving but also happiness about going home. So there was lots going on inside my head. And then we got home, and my husband (my wonderful, amazing husband) had taken the day off to pick us up and spend time with us after being away so long. We didn’t have a long hello at the airport, as it was cold and I did not travel with my winter clothes, so we jumped into the car pretty much right away. When we got home, we decided I should say hi to our dogs outside so that they didn’t break anything in the house or get too excited in a confined space. While I was outside taking our dogs for a quick walk after a loving (and slobbery) reunion, my husband was inside getting our daughter out of the car. When I got back inside, I saw my daughter crying in my husband’s arms and my husband’s stunned expression. I asked what happened, what was wrong, and he explained that nothing had happened, he just picked her up. I took her back, changed her diaper, fed her, made sure she was back to her usual happy self, and tried giving her back to my husband. And she started crying again. It was heartbreaking. I cannot fully explain the emotions both my husband and I experience when we realised that our daughter looked at him as a stranger – a scary stranger she didn’t trust. This, from our daughter who smiles happily at everyone and anyone and is content to be passed around a crowd of new friends. It was horrible, upsetting, dreadful. Everything combined (personal things that had gone on during our trip, being exhausted from traveling, the dogs being excited to have me home, my husband going from a quiet, solitary 3 weeks to a lot of commotion) was too much for us; my husband went out for a drive by himself, and I played with our daughter and dogs at home and called my Dad to let him know we had arrived home. The next day when my husband got home from work, he didn’t want to hold Cecilia though he did make funny faces and noises for her and we spent some quality family time together. Both of us had spent the day reading up on introducing children to an absent parent (mostly relating to soldiers coming home from tour). The day after that, I basically forced him to hold her when he got home from work; she was back to her normal smiling self and played with his beard and badges on his uniform. Ultimately it all worked out. But again, this was something I hadn’t thought of; neither had my husband. We were both blindsided by our daughter’s reaction, and it made for an awful homecoming. So as much as those lists of things to pack and things to do are invaluable, there are other aspects of traveling to consider. I don’t have any advice to avoid it or fix it, but I did experience it; and for me, sharing my experiences helps me understand them. Get their passport early! And be prepared to have a really hard time getting the passport photo for any kid too young to understand “sit still with a neutral expression” – especially if they can’t hold up their own head yet! Travel with a copy of their birth certificate, and a travel consent letter if your spouse/your child’s other parent is not traveling with you. Pack light in the carry-on! Only take the essentials – you’ll need less than you think if you’re a first-time parent. Our essentials included diapers and wipes, spare clothes for both of us, a blanket, a toy (not one that makes noise), my iPad with movies for myself, snacks and water. Oh, and passport, paperwork, money, etc. The usual travel essentials. Take a blanket for your baby to lie down on during layovers – I let Cecilia stretch out on her blanket on the ground while I relaxed without having to hold her for both of our layovers. Nurse or give your baby a soother during take-off and landing – it helps with the ears popping. The change tables are in the lavatories, at least on the Boeing 737’s, and they are TINY! Basically any baby longer than 2 feet is going to have their knees by their ears. And while I’m on the topic, the garbages are TINY and fill quickly – I took some doggie poop bags for dirty diapers just in case, and I am so glad I did because I needed them. I found I preferred the window seat, because I could lean against the side of the plane and rest Cecilia in that arm, and sort of expand our personal bubble. It was a pain to get out to go change her diaper when she needed it, but it was the lesser of two evils for me. Check with the airline, but most seem to check carseats for free, and will check travel strollers at the gate. 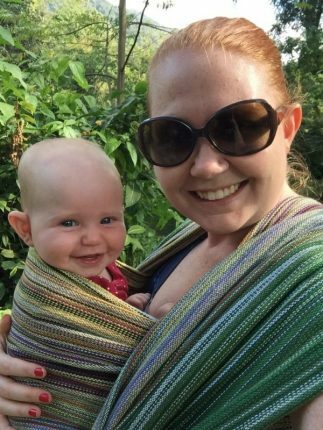 If you don’t take a stroller, take a carrier of some sort – without my ring sling to take the weight of Cecilia out of my arms, I think I would have been completely miserable. Check with the airport / border / security if you are formula-feeding regarding bringing formula (powder and liquid) and water through security. It seems pretty easy in North America to get it all through security. I’m breastfeeding so I did not personally have to deal with this. Ask for help when you need it! I asked two guys to help get my bags off the carousal and onto the cart, and I am so glad I did – lifting 50lbs of luggage with an infant strapped to my chest and a backpack full of stuff on… not my idea of a fun time! Good luck and have fun with your travels!